Congrats! We've made it to the heart of Winter. By now you've probably binge-watched to the end of your online streatming queue and are looking for other ways to stave off winter's bite. It's time to get creative. We all know there's no better sensation than seeing a place you're familiar with be glorified on camera. "Hey! I sat on that bench!" It allows us the ability to insert ourselves into a cinematic universe separate from the slushy mess outside. 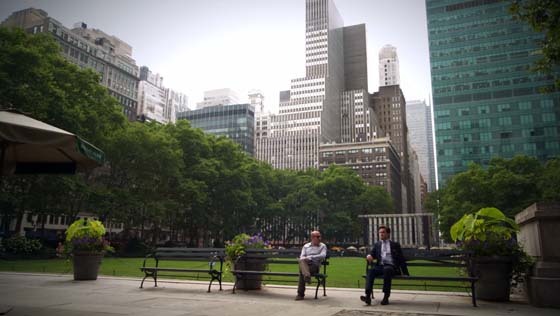 Feed your NY nostalgia with our list of content currently available for streaming, all containing scenes filmed within Bryant Park. Take a look and let us know if we missed any! Glee - Season 4, Episode 10 - "Glee, Actually"
The Scoop: "Glee, Actually" is the Christmas episode of Season 4 and as such, it breaks from the ongoing chronicles of the McKinley High School Glee Club. Episode 10 focuses on the characters themselves through short "Love, Actually"-inspired vignettes. Look Out For: Blaine and Kurt having a romantic night skating and singing (this is Glee, after all) to "White Christmas" at The Rink at Bank of America Winter Village. We pipe in seasonal classics over our sound system, so don't sweat it if you haven't prepared a duet. Courtesy of FOX. The Scoop: Jessica Jones is a former superhero who opens her own detective agency, "AKA 99 Friends" sees our protagonist being watched while doing some sleuthing of her own. Look Out For: Jessica and Simpson look through security footage for hints at who might be shadowing Jessica. Look out for the northwest corner of the park with cameos by Breads Bakery and Wafels and Dinges. Want to feel like you're solving a mystery from the comfort of your own home? Watch a live stream of the park with our webcam and create your own narratives for all the people you see. Courtesy of Netflix. 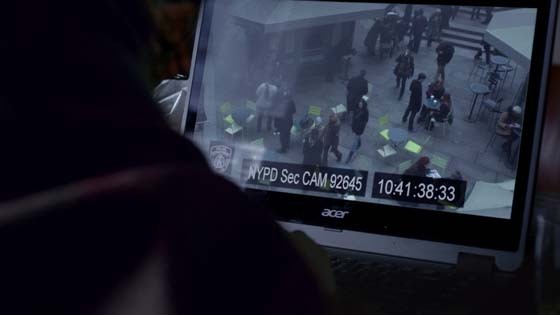 Person of Interest - Season 2, Episode 7 - "Critical"
The Scoop: "The Machine" is an advanced supercomputer utilized by the CIA that uses data mapping algorithms to identify individuals who are about to be involved in violent crimes. The CIA has identified a prominent heart surgeon as a potential victim because of her upcoming surgery involving a prominent businessman. They must work to protect her and her wife from operatives looking to coerce them into killing the businessman. Look Out For: Dr. Madeline Enright's wife is being stalked by operatives from a criminal organization who follow her movements throughout the park. Look for Le Carrousel and the Art Cart. Thankfully, Bryant Park has top-notch security so you'll never need to worry about avoiding snipers. You can, however, practice your strategic maneuvering skills during the warmer months with our table-top games. Courtesy of CBS. 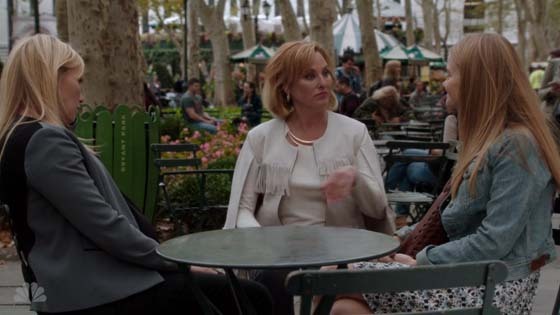 Law and Order SVU - Season 17, Episode 5 - "Maternal Instincts"
The Scoop: "Maternal Instincts" explores the familial dynamics between Detective Amanda Rollins, her delinquent sister, Kim, and their mother. Detective Rollins must not only work to solve an ongoing investigation but sort though the details of crimes her own sister is committing while walking a fine line between familial-preservation and law and order. Look Out For: Detective Rollins confronts her sister Kim about a robbery she committed while their mother, Beth Anne, is seemingly clueless to the extent of her family's dysfunction. All at a bistro table along the park's 40th Street Allée. Whether you're looking to mitigate a familial breakdown or simply enjoy a bite to eat, you can own an authentic Bryant Park Bistro Set, thanks to the Bryant Park Shop. Courtesy of NBC. White Collar - Season 3, Episode 10 - "Countdown"
The Scoop: Neal and Mozzie are cunning con-artists who have worked together in the past to pull off major heists. Neal has charm and charisma and is good at manipulating people while Mozzie has a wealth of connections to the criminal underworld and knowledge of sensitive information. They must work together to regain possession of a missing Degas painting. Look Out For: Neal and Mozzie meet on the Upper Terrace because they realize they must overcome their differences if they want to pull off a rare heist. Do you have a skilled hand for painting forgeries? Perhaps consider a less-illegal creative outlet by applying for our Painter-in Residence program this upcoming summer. Courtesy of USA Network. The Scoop: Amy Schumer portrays a magazine writer of the same name who wrestles with varying ideas of commitment and relationship dynamics. The film follows her various dates and hook-ups as she slowly allows herself to fall in love. 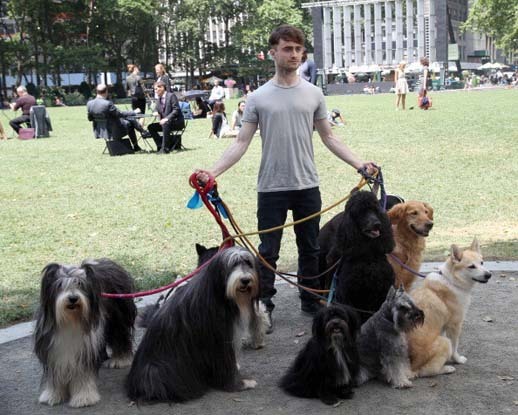 Look Out For: Amy is on a date to the movies with Steven, played by John Cena, where they watch a fictional film that inexplicably features Daniel Radcliffe walking a horde of dogs in the park. You're welcome to walk your dog in the park as long as you keep it off of the grass and pick up after it. But also, please tweet us a photo of it, because we love dogs here. Courtesy of Universal. 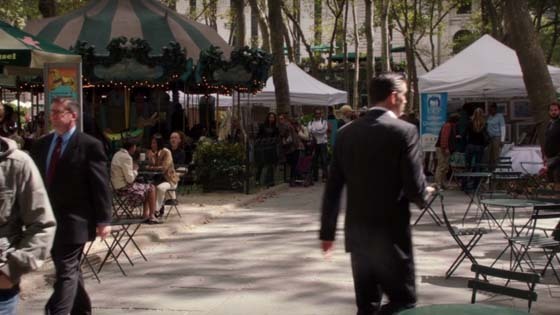 Hang around Bryant Park long enough and you might just find yourself in the background on your favorite TV show!